You're welcome, Mudpuddle. I know I'm probably in the minority over Ellery Queen, but yeah, those Wrightsville books - UGGO!!! Though I must say I did like a few of the early Queen books. I read lots of Ellery Queen books years ago and I liked them. I want to read some now and see what I think but I haven't decided where to start. This one sounds good, and I have heard good things about it. It IS good, Tracy. I used to like them too, but I've gotten old and grumpy. A fair cop on the Queens as characters, though I'm fonder of the literary, tv and probably the radio series than you...fwiw, EQMM was all Dannay's baby during his four decades there...I think Lee was more involved with their earlier magazine. Thanks! I haven't listened to the radio version, Todd. Maybe I'll look on youtube one of these days. I didn't always dislike these books, but I guess I outgrew them. Who knows? I agree with you about the characterless characters. I like the older Ellery Queen mysteries better than the later ones. I find myself picturing Jim Hutton and David Wayne as I read many of them. I do like the period atmosphere of the 1930s and 1940s best. Well, as you might know, Lee grew to have writer's block, and the cousins hired ghost writers to do their books in the later years...some very impressive writers indeed as ghosts, but the ghosting did tend to tell. My Dad was a big Ellery Queen fan and, while EQ is not among my favorite literary detectives, I enjoy the books. I confess I haven't read this one, so your review has me intrigued enough to add this to my vacation reading list. Oh this is definitely a good one, Rick. Perfect for summer reading. Agree with your comments about the closing chapters. I find a lot of later Queen fatally fatiguing. Their sort of artificiality worked best in my view in the 1930s. Yes. I did enjoy a few of their early books, but later not so much. 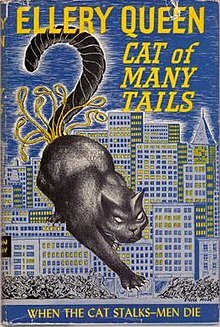 Though CAT OF MANY TAILS is not an early book which is kind the exception to the rule. This book was recommended to me when I first thought to read an Ellery Queen mystery. I liked it pretty much, and had nothing to compare it to. I - a decade later - tried another, The Spanish Cape Mystery (1935) and liked it quite a bit. Much later again I read the Wrightsville books and decided never to read another Queen novel. Those multiple endings! Argh! If I changed my mind, I'd read another of the earlier ones, perhaps The Greek Coffin Mystery or the Chinese Orange Mystery. Oh those Wrightsville books were the pits. Absolute pits. But thinking back, I did like THE CHINESE ORANGE MYSTERY, THERE WAS AN OLD WOMAN and THE FRENCH POWDER MYSTERY. But I must say that THE SPANISH CAPE MYSTERY wore me out. Ha. I believe that it was also my first intro to Ellery Queen - the book, I mean. I never saw the Peter Lawford film. I never caught the Ellery Queen bug. Not sure why. I think I might have read one or two short stories, but never a novel. Not sure even your review will be enuf to get me on board, Yvette. In fact, I'll wager the review was more fun than an EQ book would be. Possibly, Mathew. Though I do recommend CAT OF MANY TALES, especially for the ambiance of New York in the 40's.